Delivering impossible printing job in Burma | Scand-Media Corp., Ltd. Team spirit, positive thinking, flexibility, hard work and service mindedness. That is how Scand-Media Corp., Ltd, solved an “impossible mission” for an important client, the London-based NGO Global Witness. 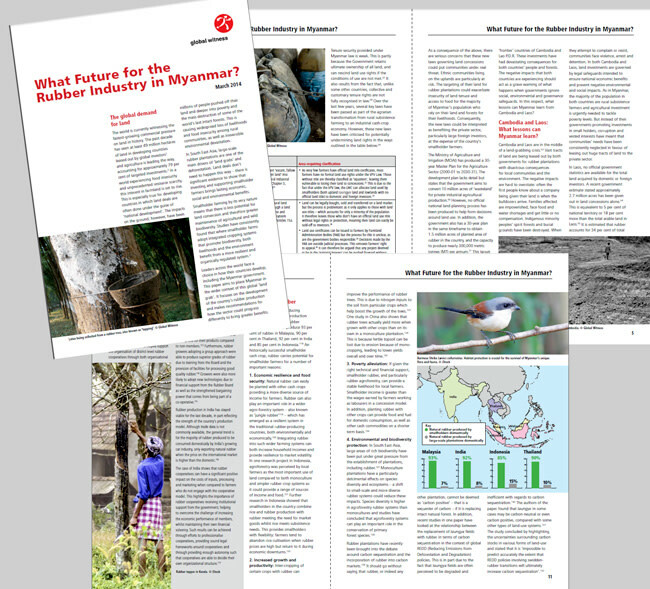 The “impossible” job was to repair a pre-press file in Burmese language where the font was missing, re-size the embedded photos, find a suitable recycled paper, print the job and finally deliver it to a hotel in down-town Yangon, the capital of Burma/Myanmar – two days prior to the planned schedule! After the job, the client expressed her gratitude for making it possible. Global Witness knew of Scand-Media’s reputation from word-of-mouth spread by the World Bank in Thailand, so when they received Scand-Media’s email introducing their graphic design and printing services, they were receptive. The job that Global Witness needed done was a special publication that should be ready before a conference addressing global warming being held concurrently in both Thailand and Myanmar. The client wanted 40 copies of a brochure in the English language and 40 copies of the same brochure in Burmese. The English version was to be sent to a hotel in Bangkok, but the Burmese version had to sent to a hotel in Yangon, Myanmar. Scand-Media set the production timeline and communicated directly with Ms. Ali through email and phone to ensure that everything was under control. “We were comfortable with our time-line and we received on schedule both the English file followed by the Burmese file,” recalls Marketing Director Ms. Patcharee Lae-ya West. But checking the files it turned turned out that they were not suitable for printing. The fonts were missing and all photos were low resolution which were not sharp enough to print. “We were especially concerned about the Burmese language as this is a language we had only worked in a few times before. An additional challenge was that the job had to be printed on recycled paper. Sourcing recycled paper is not a problem as such in Thailand, but it puts an unexpected strain on the whole project because recycled paper is more difficult to control in terms of colour and timeline,” Ms Patcharee adds. After a meeting with the team, Ms. Patcharee informed the client how Scand-Media proposed to overcome the obstacles. “Global Witness agreed. After a few proofing rounds we finally received OK to print the very night before we had to print the job to be able to complete everything in due time,” Ms. Patcharee explains. Then the next morning an email arrived that made the job look simply impossible. For unexpected reasons the Burmese version of the brochure needed to arrive Yangon two days earlier than originally planned! “There seemed to be really no way we would be able to accommodate this deadline and we were all quite disheartened,” Ms. Patcharee recalls. Eventually – thinking out of the box – the team turned to a Danish journalist who was currently an intern at Scand-Media’s news department, Kristian Kruger Lauritzen. The intern was asked to drop whatever he was doing and get on the first plane to Yangon with the brochures in his hand luggage and hand-deliver them to the person at the requested hotel. Amazingly, the brochures were eventually not only delivered safe and sound on time – the delivery also ended up being less expensive than the express courier would have cost. As for the English brochures, Global Witness received them on time without any drama together with the additional Burmese brochures on the day Ms Ali arrived for the conference. “It is always a great feeling when we are able to achieve the impossible,” says Ms. Patcharee Lae-ya West, Scand-Media Corp., Ltd.